← Local beats Corporate… again! While we’re waiting for the economy to “rebound” (ain’t gonna happen, but that’s another post), it is important to really understand that a lot of the well-paying, benefits-providing jobs that existed before the recession just aren’t coming back. More and more of the “middle class” are finding it increasingly difficult to find work in their professions. As if that’s not bad enough, there will still be a significant loss of even more jobs over the next decade as technology continues to replace many of the practices and processes which kept us employed. The jobs they are being replaced with will pay absolutely miserable salaries… at least based on the needs of an average 2-car, house in the suburbs with a 30-year mortgage family. 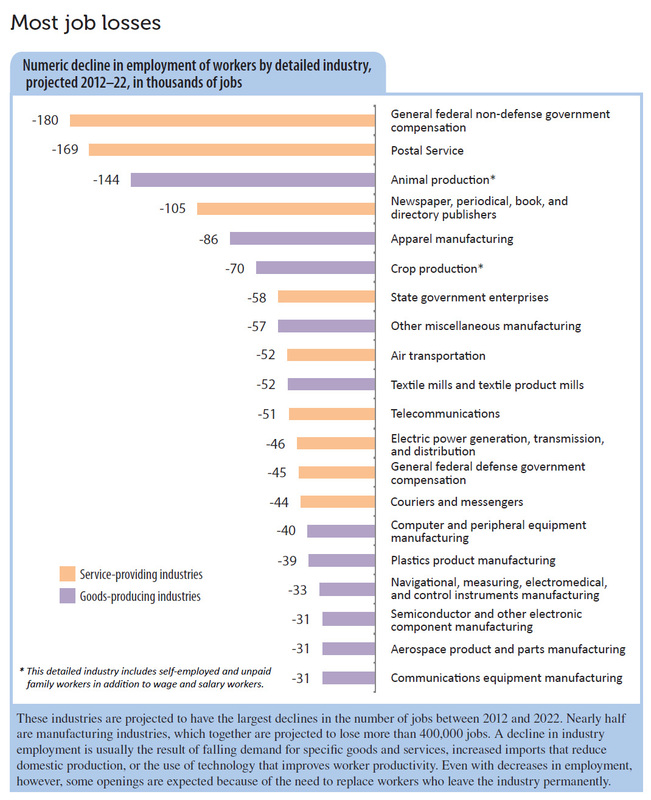 This is due in large part to the projected increase in service-sector jobs. 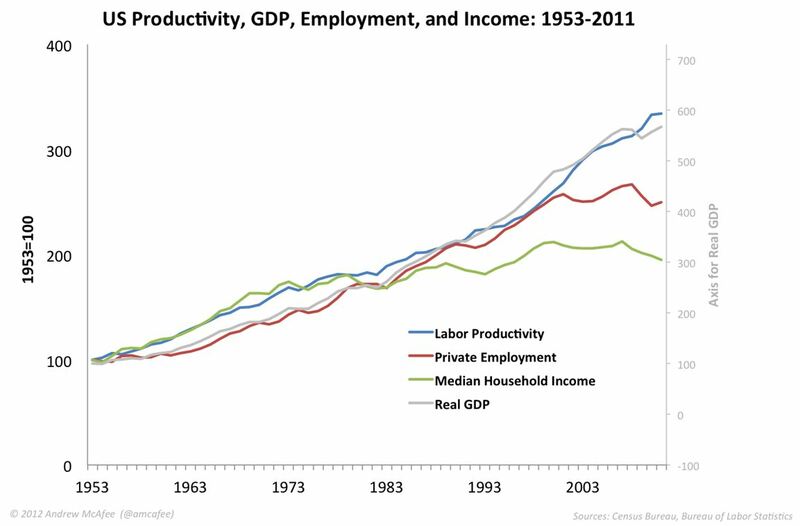 “We’ve been experiencing a long, slow decoupling between “output and productivity” (Blue & Grey) and “jobs and wages” (Red & Green). For more than three decades after the end of World War II all four of these measures went up together. 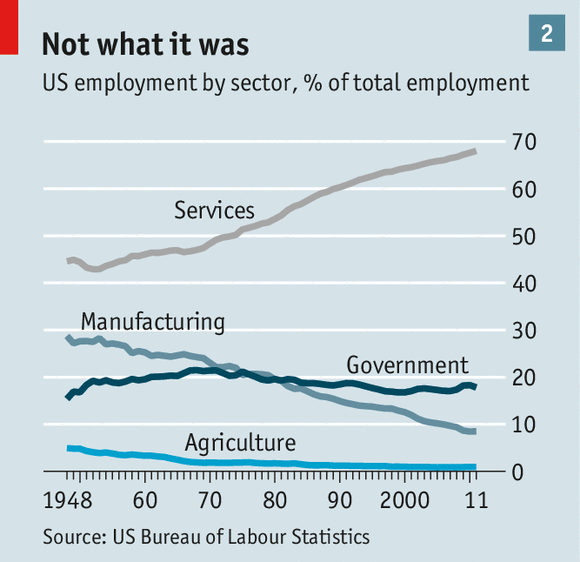 In the early 1980s the picture started to change for the average American worker. There were still a lot of jobs available, but they started to pay less well. Median household income became decoupled from the other three stats and grew more slowly than they did. By the time of the 2001 recession, median income was lagging behind pretty badly. … digital technologies have been able to do routine work for a while now. This allows them to substitute for less-skilled and -educated workers, and puts a lot of downward pressure on the median wage. As computers and robots get more and more powerful while simultaneously getting cheaper and more widespread this phenomenon spreads, to the point where economically rational employers prefer buying more technology over hiring more workers. For more detail, you can read the article: “How Technology is Destroying Jobs“. RLB isn’t in the position to land a “large” employer; we depend on companies around us. From that perspective, Lake County loses at least a couple of companies a year to WI, thanks to aggressive, consistent, and obviously tempting offerings by WI state and local officials, commercial property holders and partner financiers. Of course, Illinois has a rather unfavorable business climate, which has helped motivate potential employers to relocate to more favorable climes. THAT is a BIG part of why we keep going on about “resilience“, about “not having all our eggs in one basket” as far as our local economic model is concerned, and why an interconnected, multi-user infrastructure is so important, why we need our own aggressive plan to not only attract existing businesses here but create conditions favorable to small and new-business start-ups and home-based businesses. According to the AAA, the average cost in 2013 to own a sedan was over $9,000! At least one car in a 2-car family is often used for commuting to work from the suburbs; with fewer jobs, fewer breadwinners, and 2nd-cars for long-commutes less necessary… physically-accessible in-town jobs will be especially important. IN-TOWN jobs. 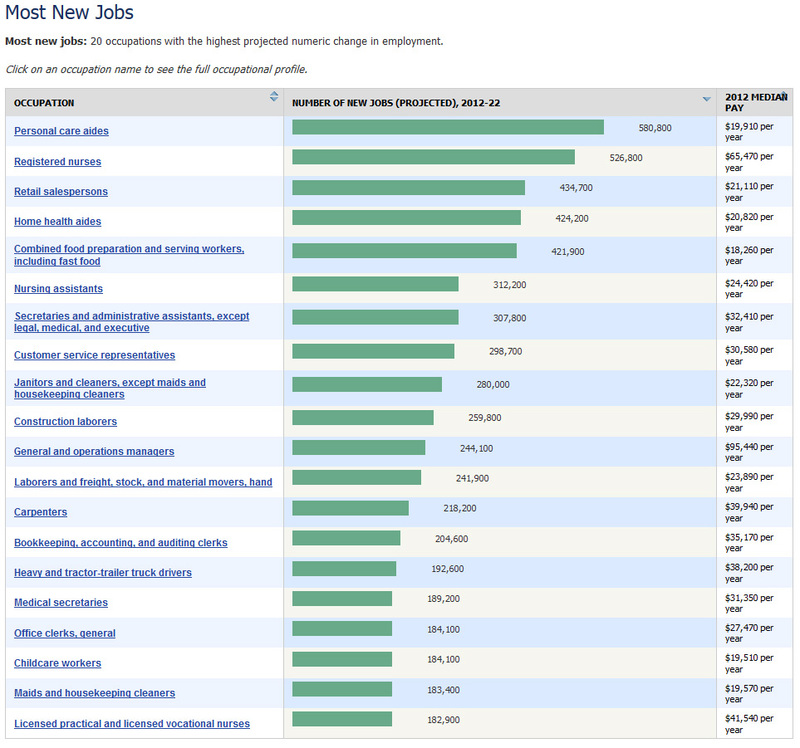 “New Economy” jobs. 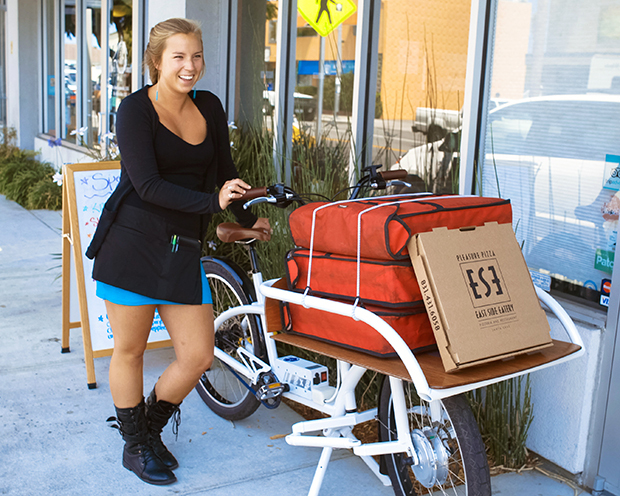 “Sharing Economy” Jobs. Jobs of the type which didn’t exist before. Current rules, ordinances, and “mindsets” are unprepared to handle these new types of jobs, nor can they easily deal with the structural and policy changes in residences and neighborhoods that would allow our residents to do more with their own homes to significantly reduce expenses and cost-of-living… essential with fewer “traditional” jobs around. This entry was posted in Business, Economics, Planning. Bookmark the permalink.